Google Play Best App of 2016! 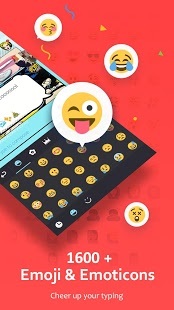 Tap fast and fun with sticker, theme, 1600+ emoji! GO Keyboard 2015 is an Android app developed by GO Keyboard Dev Team (17th floor ,Tower A,China International Center NO.33 Zhongshan 3rd Road Yue Xiu district,GuangZhou,China). Others apps created by GO Keyboard Dev Team are: Twemoji for GO Keyboard, GO Keyboard. GO Keyboard 2015 first became available on 13 Jan 2015. GO Keyboard 2015 has been awarded with the "Top Developer" badge. It is estimated that GO Keyboard 2015 has been downloaded between 100000000 and 500000000 times from the Play Store. Allows an app to create windows using the type TYPE_SYSTEM_ALERT, shown on top of all other apps. Very few apps should use this permission; these windows are intended for system-level interaction with the user. Thai language pack for GO Keyboard with 800+ emoji and 10000+ color themes. Apply awesome keyboard to your mobile phone.